Death Walks is a zombie movie with a difference. Taking a zombie invasion into a UK shopping centre, it would be very easy to tell a traditional zombie tale, and take a leaf out of the book of Dawn Of The Dead. But the movies creators are adamant despite what it might seem, that Death Walks is unlike any other zombie film we have ever seen. Set during the midnight hours, Death Walks tells the story of 15 characters caught on the inside of a shopping centre as an army of very different zombies take control. Shot entirely on location in Romford’s the Mercury Mall, it’s not just the story and the twists that are different. Writer/Director Spencer Hawken has gathered a cast and crew in excess of 350 people together at absolutely no cost. It’s the community that are at the heart of this project, many giving up to a hundred of hours of their time to create the biggest zero budget movie of all time. It’s not just individuals that are aboard the project, giant multi-national companies are donating products, location, or staff to make the film a real success. With 12 hours filming under the makers belt, there are four more six hour sessions of filming scheduled to complete this movie. Actress Lucinda Rhodes who has made movies both in the UK and across the globe knows only too well how hard it can be “The industry has changed, it’s all gone a bit sour, what we are doing here may well change the way things work.” Lucinda was one of the first actresses to volunteer their time on the project, but as Spencer spent more time with her he realised that working with Lucinda they could create something truly epic, so persuaded her to step aboard as a producer as well as an actor. The revolutionary approach has already scored the project over £250,000 in free PR to promote the movie, and it’s a conversation topic on the lips of everyone locally. The project is not only the subject of the press attention, but it’s also being followed by a film-maker and a television channel making varied behind the scenes films. Monday 15th of July saw the movie swing into production, with two-hundred plus people gathering at the shopping centre to begin shooting some of the many scenes involved in this epic, the filming took place over a twelve hour period, the cost normaly associated with such a gathering which included five film crews would normally have cost up to £40,000. Resturaunt chain Subway stayed open and fed the cast and crew twice during the shoot. Shooting continues early next week, the returning crowds adding to the virtual production value, which Spencer states would be in excess of half a million pounds if you include products, labour and location by the time the shooting reaches its conclusion. 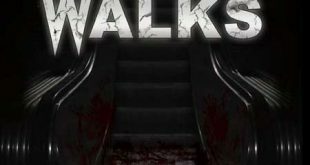 The makers hope to complete filming on Death Walks during August, with a view to releasing a trailer in time for Halloween, and launching the movie onto the festival circuit in early 2014. Thanks so much guys for covering our story, We are really trying to do something “different” with this, we hope the world will be pleased with our end result!